1. All setups of “Lazur-M” series designed for water and sewage disinfection are characterized by the irradiation degree of microflora corresponding to the actual international standards, that is, over 40 mJ/cm2. This level provides a high degree of disinfection virtually for all kinds of microoorganisms with regard to the period of the nearest next 30 years taking into consideration the permanent adaptation of microflora to the action of ultraviolet radiation. The real starting level of the irradiation degree in setups of Lazur-M series for water and sewage disinfection comprises 65 – 70 mJ/cm2. Note, that all other Russian companies offer the equipment with significantly worse values of this parameter. 2. 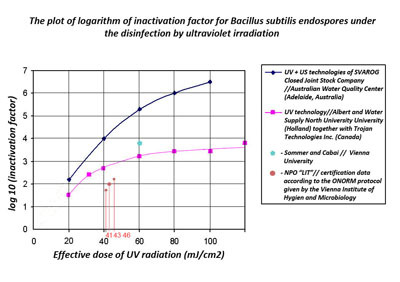 The true cost of a “Lazur-M” setup for potable water and sewage disinfection at commensurable levels of UV irradiation is by 1.5 – 2 times lower as compared with setups offered by other companies such as LIT Company, EGA-XXI Century Company, and Lapek Company. 3. The warranty lifetime of our setups for potable water and sewage disinfection is no less than 2 years including that for all replaceable elements and units such as UV lamps and US transmitters, that is, significantly longer than the warranty time provided by any other manufacturing company. 4. The simultaneous operation of UV (ultraviolet) and US (ultrasonic) devices inside the body of setup designed for water and sewage disinfection allows one to reduce by a factor of 5 – 6 an amount of reagents which may be used according to a specific technology (for example, in swimming pools or other systems with water recycling). In a case, when bactericidal setups are placed after a point of disinfectant inlet under the secondary chlorination, a significant reduction in the reagent consumption may be achieved due to its effective dispersion by means of ultrasound. 5. Our setups for water and sewage disinfection require no chemical washing. This circumstance is of great importance specifically for the disinfection of sewage with low transparency and large content of suspended substances. The setups of LIT Company require transparency for UV radiation higher than 60% per 1 cm liquid layer and no more than 2 – 3 mg/l of suspended particles (that is, they need the use of carbon filters, as is realized, for example, in Bratsk system); only in such a case the setups are washed rarely. The washing operations are very costly. 6. Ultrasonic transmitters effectively inactivate lamblia cysts and oocysts (see methodical instructions MU 3.2.1757.03) and in combination with UV irradiation ensure their complete sterilization. 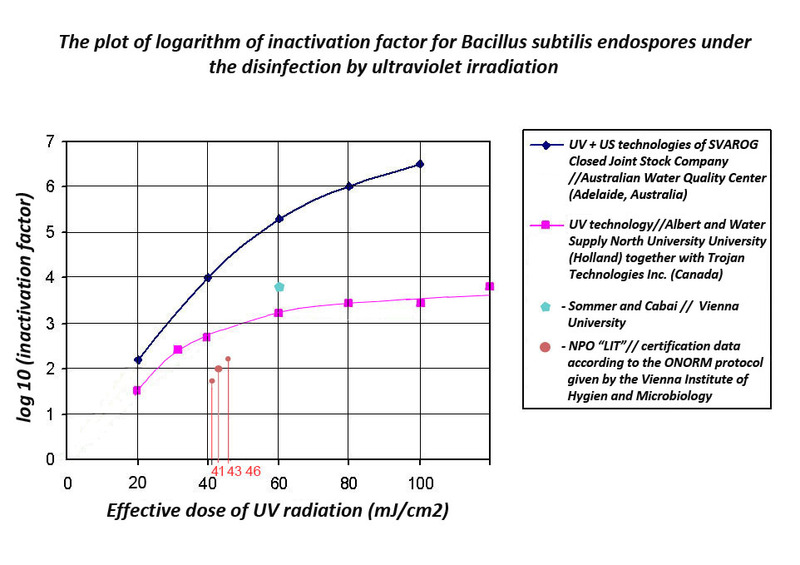 When only UV irradiation is used for the disinfection of sewage and potable water, the necessary minimal irradiation doses should be over 65 mJ/cm2 and no less than 45 mJ/cm2, respectively. 7. 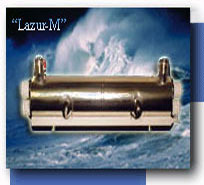 The setups of Lazur-M series are characterized by low weight and small overall dimensions. In contrast to the equipment of LIT Company, our setups do not require special basements because the weight of every module with water of high throughput rate does not exceed 250 kg (the weight of corresponding unit of LIT Company is 4000 kg). 8. The modular design of water and sewage disinfection stations based on the use of units with throughput rate of 500 m3/h is economically more advantageous. With that, our reserve unit is less expensive than that of LIT Company. Moreover, during night time, when water consumption is usually reduced, a part of Lazur-M units may be switched off that provides a considerable economy in energy expenditures. 9. All Lazur-M units designed for water and sewage disinfection by ultraviolet irradiation and ultrasound are assembled from easily replaceable blocks and components. In principle, a replacement operation may be performed without complete switching off of a unit. 10. All units for water and sewage disinfection by ultraviolet irradiation and ultrasound of Lazur-M series were really certified in the Russian Federation and abroad that is confirmed by corresponding reports and documents. The production of SVAROG Company is certified according to the ISO-9001 international standard. 11. The manufacturing of reactor bodies, UV lamps, control cabinets, and other key components is duplicated and provided with efficient equipment. As a result, short terms of order fulfillment are ensured. 12. Every unit designed for water and sewage disinfection by UV irradiation and ultrasound passes thorough quality inspection and testing in assembled state that provides very high reliability and minimal time –consuming in processes of starting-up and adjustment at customer facilities.